Rose is a freelance hair and make-up artist who also works closely with the Liz Earle Beauty brand, celebrities and international bridal clients. Rose is based in London, but travels far and wide and knows how to get you walking down the aisle looking like an absolute goddess. See also the amazing guide she wrote for Bridebook on making the decision between hair up and hair down here. Enjoy! Love these photos? All of these hair dos are done by Rose herself! From clips, combs and hair-pins to flower crowns and wreaths, there are many ideas to consider, and it can be a lot of fun exploring the options available. You want to ensure that the hair accessory you choose compliments your dress, your hairstyle and your jewellery. The overall theme and setting of the wedding also plays a part; for instance, if your wedding features a country garden setting, soft floral hair accessories can work beautifully. For an evening do, you may wish to choose something more dramatic and sparkly to catch the light. 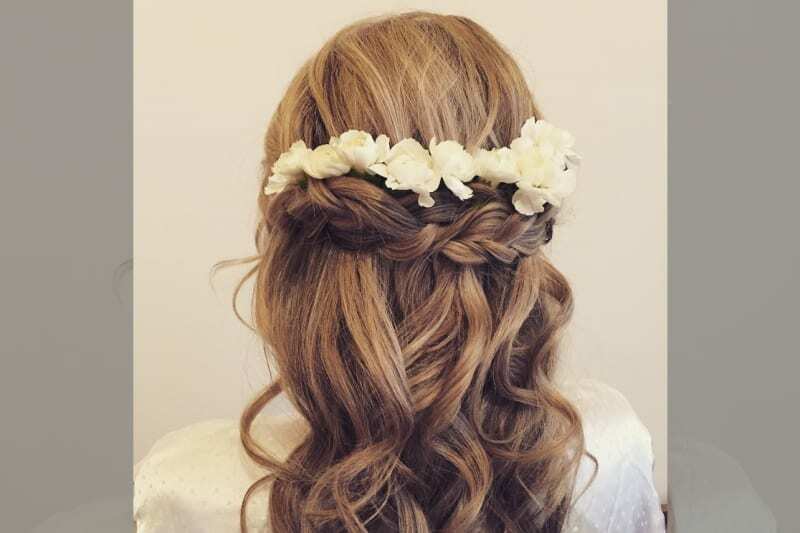 Some brides choose to make their hair accessory a main feature, opting for bold and colourful floral wreaths and flower crowns, a perfect choice for hair down styles and boho brides. That said, if you want the focus to be purely on the dress, the jewellery and the veil (not to mention your beautiful bridal hair style) – you can choose not to have any hair accessories at all, or just add one in for the evening before your first dance. The following considerations should help you to decide the type of hair accessory that’s right for your day. Look at the fabric in your dress, are there any ‘sparkly’ or ‘pearly’ elements, or is the material matte? It’s lovely to tie in your hair accessory with the types of fabric in your dress. For example, lace bridal hair combs can really compliment a lace gown, while a crystal hair accessory will work beautifully with a dress with featuring any crystal detailing. The colour tones of your dress can also be used as a guide for selecting a complimentary hair accessory. 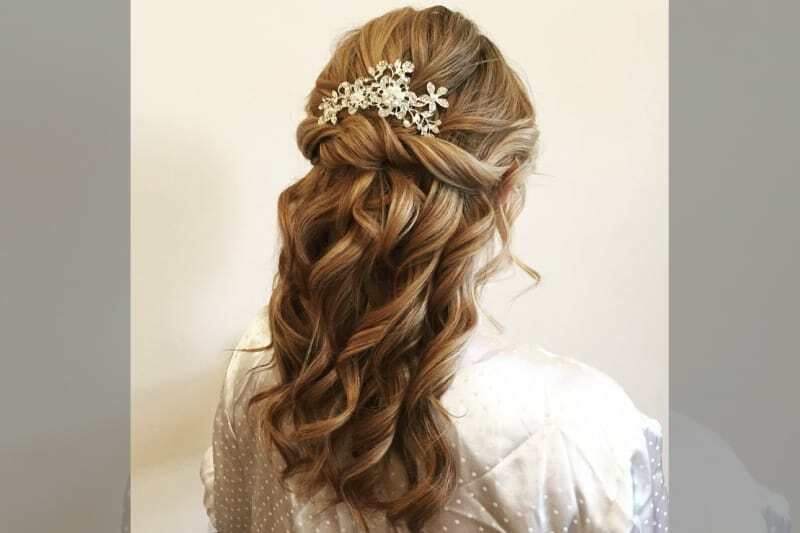 These romantic curls and beautiful hair piece would go perfectly with a crystal detailed dress. Hair accessories can work with all bridal hairstyles; up, down and half up. Once you have chosen the perfect bridal hair accessory, you can select similar complimentary hair accessories for your bridal party. 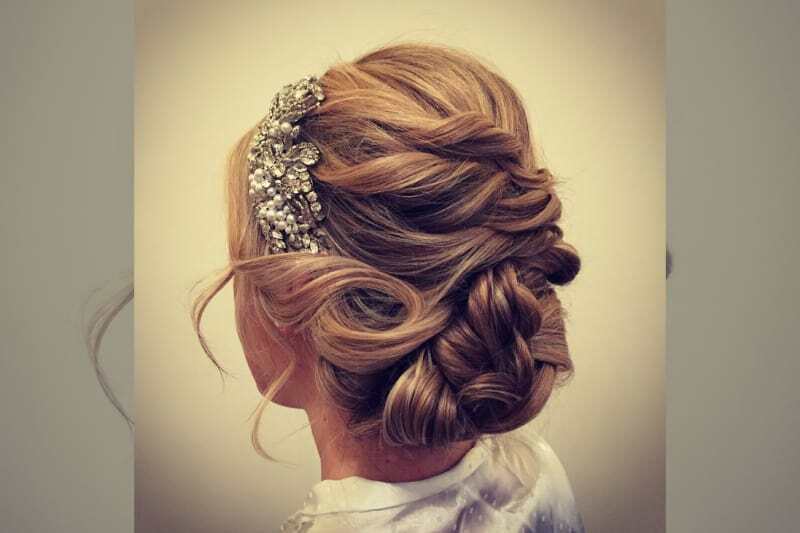 If your bridesmaids are having different hairstyles, a hair accessory could be a lovely way to unify them and maintain your look and feel across the board. 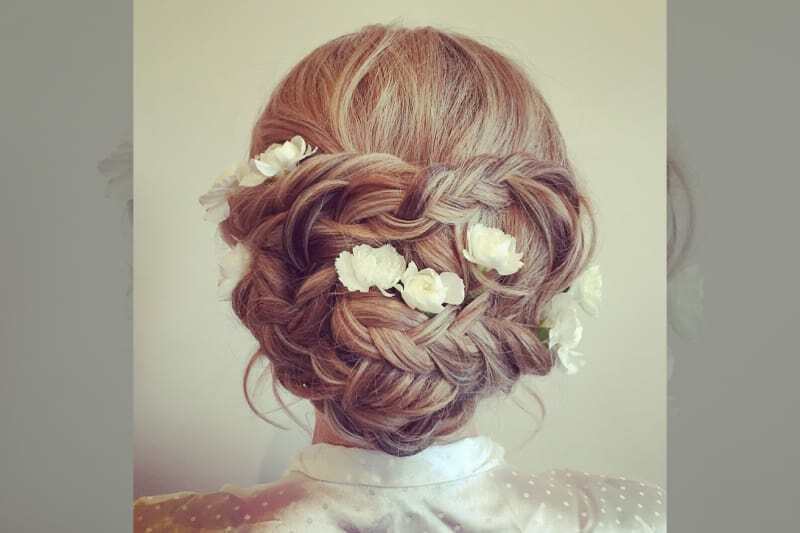 Pair this gorgeous bridal up do by sprinkling complementing flowers in your bridal party’s hair dos. Any hair accessories you choose should work colour tone wise with your jewellery. As with your dress, it can be nice to match up elements of the detail (pearls, crystals, diamonds) between your jewellery and hair accessory. If you decide to wear a veil, make sure that the hair accessory you choose can be worn with the veil, or have one of your bridesmaids on duty to help you out it on once the veil is taken off. In love with any or all of these gorgeous hair styles? Check out Rose’s very own Bridebook profile and book her for your big day!